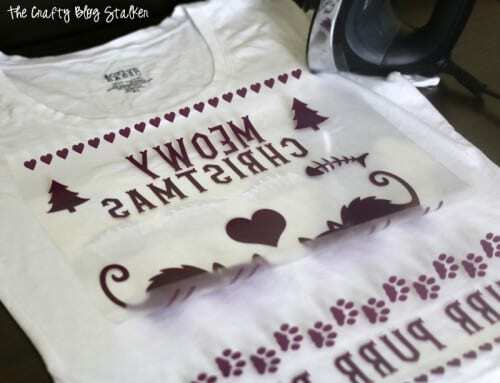 Use the Cricut and Iron-on Vinyl to create an Ugly Christmas Sweater Shirt. An easy DIY craft tutorial idea for cat lovers and cat haters. 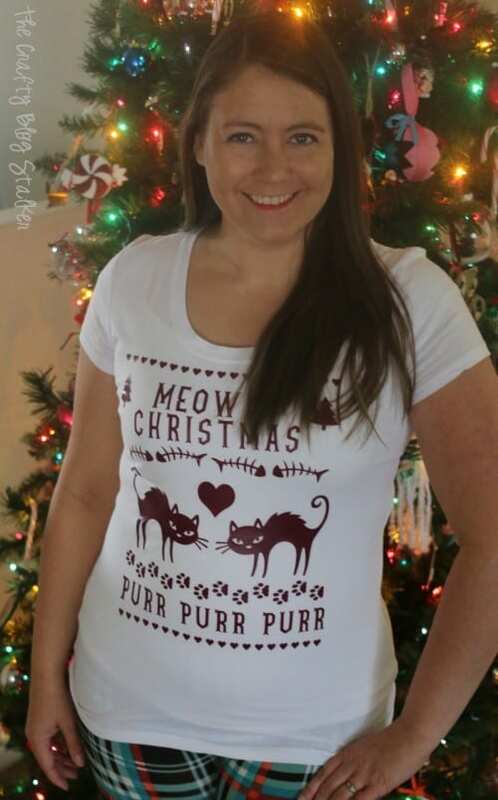 Meowy Christmas! This is a sponsored post on behalf of Cricut. All opinions are my own because I love giving you helpful tutorials! Ugly Christmas sweaters are just a part of holidays. In fact, I am starting to think that all of those ugly Christmas sweaters are actually cute! Okay, okay, not all of them, but a lot of them are. My ugly sweater is actually a shirt, but since it is an iron-on you could put it on whatever type of shirt or sweater that you want. I created this file using several images from Cricut Design Space. You are welcome to use it but may have to purchase the images before you cut. When working with Iron-on it is very important that you click the box to mirror the image so that when you iron on the words they are going the right direction. It is also very important to make sure that the dial is set to the right material. When I first hit go on my Cricut and it began cutting I did not check the dial. A couple rows in I noticed it was set to cardstock so the blade actually cut through all layers of Iron-on. You don’t want it to do that. I paused the cut, set the dial to Iron-on and hit resume. The rest of the image was cut out correctly. It only affected a couple of rows so I recut those when the first was finished. I learned my lesson! 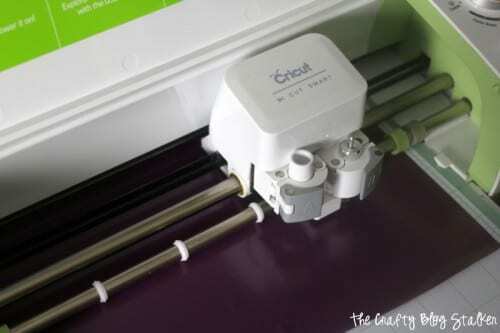 When the Cricut is finished cutting you’ll need to remove the negative Iron-on film. This is called weeding. Now it’s time to iron on the Iron-on! 🙂 Set iron to the Cotton/Linen setting with the steam setting shut off. Preheat your fabric for 10-15 seconds by running the iron over the shirt. Then lay the image right side up on the shirt. I like to use a towel between the Iron-on and the iron. Apply medium pressure with the iron for 25 – 30 seconds making sure to cover all areas of the images. Flip the shirt over and again apply medium pressure with the iron for 25 – 30 seconds. Let the Iron-on cool completely before removing. If there are areas of the image that aren’t sticking, use the front point of the iron and go over the image. That’s all there is to it. Easy Peasy! 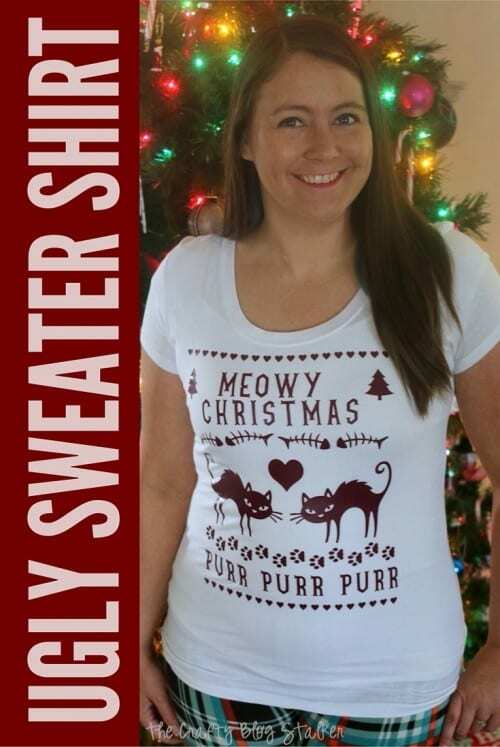 Now you have a super cute ugly Christmas sweater that is really a shirt! 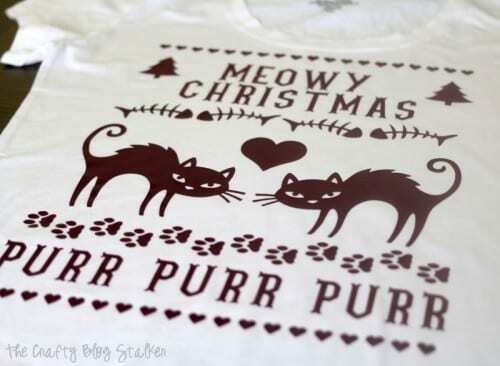 This ugly sweater design is so much fun whether you love or hate cats. Great for that Ugly Sweater Party or cute enough to wear just cuz it’s cute! So what you think, is this an Ugly Christmas Sweater Shirt or a Cute Christmas Sweater Shirt? You can tell me the truth! 🙂 Share and leave a comment below! SAVE HOW TO UGLY CHRISTMAS SWEATER SHIRT TO YOUR FAVORITE PINTEREST BOARD! That is the cutest idea ever! I love it!!!! Thank you!! The weeding took time (as usual) and I had to be particularly careful around the paw prints with my weeder tool, but it turned out GREAT. I did have to purchase some of the images. You are welcome Kate! I am so glad you liked the project!